You cannot go to Malawi without visiting the lake. 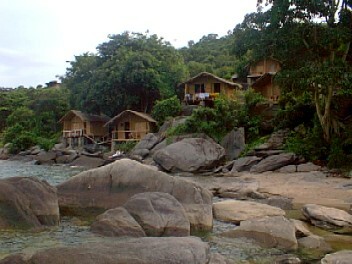 The best place to stay is Njaya lodge in Nkhota Bay. Historic Livingstonia takes you back in time and it is delightful to see the property of Dr Laws. Three local boys said they would look after the car as we were getting the documents stamped. We said thanks very much but the car did not need looking after. Wrong! I thought they were looking mischievous as I watched them through the window of customs so went to sit in the car while Andrew sorted out the paperwork. Nothing seemed wrong at the time but the next day we discovered that Simon had etched his name in the dirty bonnet. (Top tip - say thanks and give them a few penny equivalents). Malawi greeted us with beautifully lush countryside. There was high grass on either side of the road into which the locals dived as a car approached. We had a problem with the emergency alarm button in the car and decided to take it apart whilst driving along. A lead had fallen off the back of it and putting it back on normally wouldn't have been a problem. Today however, the alarm, all sirens and lights went off just as we were passing a walking funeral procession. Panic - pull the leads off quickly. It took all our effort to contain our laughter until we'd passed the group. At Blantyre we were a little late for the banks so with a skinny wallet made our way to Doogles Campsite for the night where we had an evening of working on the car and preparing our route through Malawi. In the morning the sun woke us up early. Hooray, sunshine. Where was the rain that usually greeted us? We had planned to get some money from the bank today. Being a Friday, it shouldn't have been a problem. Top planning again. It was Martyrs Day - a bank holiday! Fortunately the campsite changed some of our dollars before we headed towards Cape Maclear for a couple of days on Lake Malawi. We wondered what the normal road conditions were like as we passed the "Pack and Go Coffin Shop"! Malawi is like a little package of West Africa. It looks the same, smells the same and has the same atmosphere. The stalls by the side of the roads are similar including the way they display tomatoes and potatoes in little pyramids. Punda was flying along the roads with her new oil. She's a fussy bird. Cape Maclear is described in the guide books as a laid back place where you go for a few days and stay until your visa runs out (not that we need visas). We were met by touts, a run down community and disgusting toilets. Stevens Campsite was a bit of a hole next to the lake where Bilharzia threatens. Andrew wasn't feeling very well and it was 40°C. At least the heat was welcome. We had intended to stay a few nights but one night of the local music was enough to send us packing. We did purchase a fresh fish though from a local and wondered how on earth we were going to manage to eat it all. Almost a days drive up the coast and we arrived at Nkhota Bay. 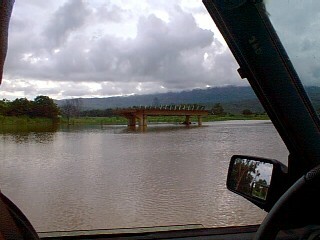 One bridge was out so we had to make a detour having decided that the exit angle of the river was likely to cause the back end to flood. We wondered if this was the river that Gordon had got stuck in a few weeks ago and had to pay the locals a huge sum of money to pull him out! At one point along the route one of the tyres developed a slow puncture. 21 local observers joined us to watch the compressor pump up the tyre. They had nothing better to do. 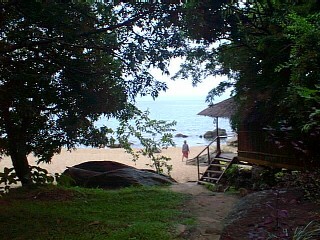 Nkhota Bay is a pleasant town and the delightful Njaya Lodge was a gem of a find. You can camp in the carpark or stay in huts on the golden beach. There is a bar that makes cocktails; films on the satellite TV and Raffles-type wicker chairs in the lounge where you can sit and take in the spectacular view over the lake. That evening we ate half of the fish before repairing the puncture then indulging in some cocktails. We had planned to spend the next day on the beach but Murphy's was playing with us. Instead the rain poured as we watched Die Hard 2 on the TV whilst enjoying coffee and cake. The BBC reported that the UK temperature was -5°C so we didn't feel so bad after all. The afternoon was fine though so we sat on the beach playing scrabble. On Monday 6th we left Njaya to get to the bank in Mzuzu. We had hoped to get a stash in US dollars but they reported having none despite the fact that we had seen fellow overlanders exchange dollars for local currency. They fibbed and are holding onto any hard currency they can get! Eventually we exchanged with another overlander who was travelling south. The markets are lovely and I went around with a smile on my face as I bought up avocado and plantain. Oh, for a plantain curry. The Malawi's are such lovely gentle people. They are a delight to barter with. We decided to go to Livingstonia as we weren't spending long in Malawi and wanted to get some understanding of the country. Malawi is primarily a Protestant country after the influence of Livingstone and his followers, particularly Dr Laws in the 1800s and early 1900s. The missionary movement was, and still is, very important here. The route to Livingstonia was pretty awful and the final 11 km up the hill was diabolical. Sharp hairpin bends and mud made this four wheel drive territory. At the top of the mountain Livingstonia was a quagmire so we decided to visit the museum then buzz off back down the hill before it rained some more. However, the museum was fascinating. There were photos of early missionary goings-on and early glass slides with pictures of a variety of scenes, including the Forth Bridge (Dr Laws was Scottish). The museum is housed in what was Dr Laws house and the building is now also a hostel. This place had so much history and such an atmosphere of timelessness that we decided to stay the night in Laws' house. Surprisingly there was electricity on demand all day and all night! After a beef stew dinner we retired to our "cots" for the night. It poured and poured during the night and we had visions of taking the quick route down the mountain! 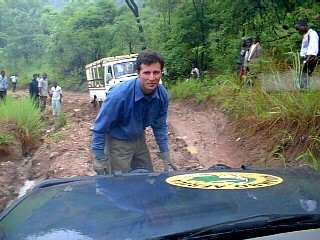 As we left Livingstonia we went slip sliding all over the place through the worsening bog on the mountain top. Locals came out to witness which daft nutters in cars were attempting the descent. We were seriously all over the road and the locals had to dive out of the way as Punda decided where she wanted to go or, more accurately, where the mud wanted to take us. First gear in low box with the limited slip diffs on were essential as we descended the mountain road and its hairpins. For once the rocks became our friends. Then we met the stuck truck (Toyota) coming up the single lane road. There were people pushing and digging and getting covered in mud and were getting nowhere. Punda to the rescue! The winch came out to play and saved the day. We were not sorry to see the tar road as we reached the bottom of the hill. 11 km later we were flagged down by Reverend John whose Toyota had broken down (not that there is any rivalry here between Toyota and Landys). The clutch was entirely broken and they asked for a tow. Fortunately they had their own rope (have mended ours now but are a little reluctant to use it) which was slightly elastic and made towing quite easy. This was just as well because the road was the worst so far in southern Africa. Potholes galore. 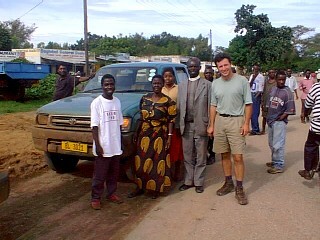 Without realising the distance Andrew agreed to take the reverend to his destination of Karonga. 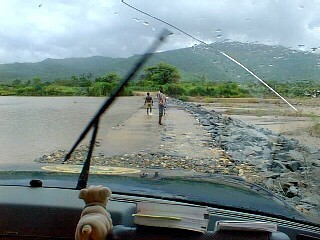 Pothole avoidance and careful driving at 30 km/hr meant that driving the 100 km to Karonga was a long journey! The reverend couldn't believe his luck. Should have got the union flag out! At Karonga we dropped off the Toyota and used up all our Malawi Kwacha on fuel and sweets before completing the final 50 km on very good road to the border with Tanzania. Obviously fish is the staple diet of the locals, supplied via the lake. Malawi is a very relaxed friendly country. It is easy to get by. The biggest problem here is the threat of Malaria which is rife given the presence of the lake. Lake Malawi is the third largest lake in the world and constitutes a third of Malawi's area. Bilharzia is a virus carried through two vectors - fresh water snails and humans. Locals will tell you that it is safe to swim in the lake (indeed people scuba dive in it) but the prevalence of Bilharzia is localised. If there are reeds growing on the shore then avoid the area as this is likely stomping ground for the snails. Cleared areas are generally safe. I have heard many stories about the capital, Lilongwe being a town where you are very likely to be robbed. We didn't go so do not have an opinion on the place. The bakery shops make lovely bread including the first batch of decent brown bread I have seen in a while.